Lee Leander (Barbara Stanwyck) has been caught stealing jewelry. It’s her third offense and she’s looking at a hefty sentence. In his opening statement, her attorney has cooked up a cockamamie defense involving hypnosis. But district attorney Jack Sargent (Fred MacMurray) suspects that the jury, full of Christmas spirit, will acquit her. So he arranges to postpone the trial until after the New Year. Feeling guilty over his ploy, he pays her bond so she can enjoy the holidays. Unfortunately, she gets dropped off at his door. When they discover they’re both from Indiana, they agree to take the road trip together. After a close call of their own with the law, they wind up at house where Lee grew up… but her mother (Georgia Caine) wants nothing to do with her. So Jack takes her to his own home, where his mother (Beulah Bondi), Aunt Emma (Elizabeth Patterson) and helper Willie (Sterling Holloway, who I momentarily got mixed up with Stanley Holloway of My Fair Lady) welcome her with open arms. What a wonderful gem this is. The script by Preston Sturges is full of charming wit and the direction by Mitchell Leisen is incredibly generous with sentiment. Both have their roots in screwball comedy (Leisen’s lively Midnight and Preston arguably the king of the genre) but here they allow the comedy — which itself is delightful — to give way to deep, embracing warmth. Who wouldn’t be bowled over by the hospitality of the Sargent household, with Ma Beulah Bondi (two years after playing a much more elderly character in the gorgeous Make Way for Tomorrow) doting on you and the kindness of Aunt Emma and the goofy eccentricity of Willie (with such a surprisingly lovely singing voice). The contrast between the joy of Jack’s home and the cold rejection of Lee’s home lays the foundation for a fabulous, heartfelt romance. MacMurray and Stanwyck would of course meet again in the noir masterpiece Double Indemnity and the Sirk melodrama There’s Always Tomorrow (which could almost be an unofficial sequel to this film) among other pairings, but this was their first film together. The chemistry is fully felt, and the sparks fly whether in sly glances or steamy embraces. It’s a beautifully realized romance, the alacrity of which is easily accepted as Movie Magic. The groundwork is laid in their amusing cross-country adventures and the romance blossoms as Lee is welcomed as a human being with feelings rather than a scofflaw and disappointment. 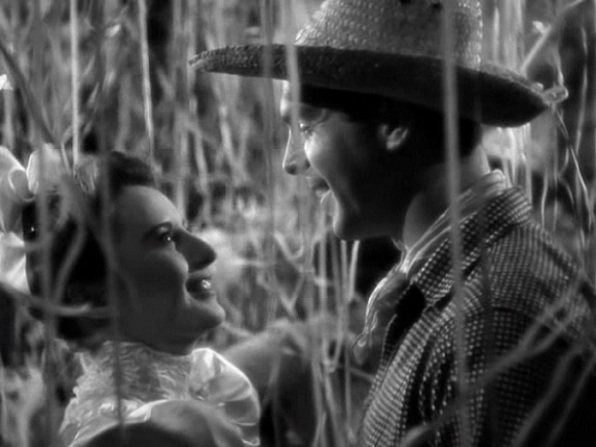 And my lord, Stanwyck (who has ties to Sturges in The Lady Eve and Leisen in No Man of Her Own — both fantastic films in their own right) is just the greatest. At the film’s climax we watch her face go from hurt to confusion to revelation to joy and then to sorrow. Seamlessly. This entry was posted on March 8, 2014 at 9:10 pm	and is filed under Movie Reviews. You can follow any responses to this entry through the RSS 2.0 feed. You can leave a response, or trackback from your own site.